Dr. Meyer grew up in the Austin neighborhood of Chicago. She attended St. Lucy’s Grammar School (1954) and graduated from Trinity High School, in 1958. She received her B.A. in English (1969) at the University of Illinois-Chicago Circle. Dr. Meyer received her M.A. (1970) and Ph.D. (1980) in English from the University of Wisconsin-Madison. The title of her dissertation is: The shell and the wave : a study of narrative form in Chimera by John Barth and 98.6 by Ronald Sukenick. Dr. Meyer taught English Literature at Western Illinois University in the early 70’s. She taught in the English Department from 1976-1980 at Milton College in Milton, Wisconsin. 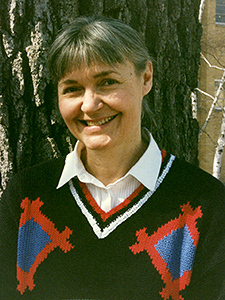 From 1980 until her retirement in 2005, she taught and served as Chair of the English Department (for a number of years) at Edgewood College.